Staffordshire bull terriers, or Staffies as they are affectionately known, are one of the most popular dog breeds in the country. With their dynamic, yet gentle personalities, these beautiful dogs see life as a joyful adventure. In the hands of responsible owners, these gentle dogs, with an affinity for human companionship, know how to live life to the fullest. 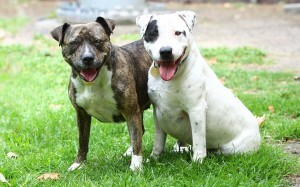 If you have been looking for a loyal and lovable dog for your family, perhaps Staffies are the breed for you. 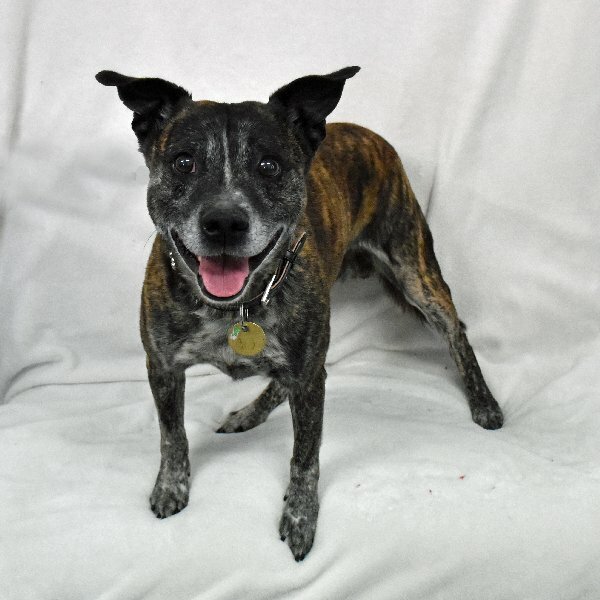 Our North Melbourne and Campaspe shelters have a number of loving Staffies looking for their perfect forever home. Think you might be their perfect match? Come down to our shelters and meet them in the fur. Five year-old Kyle is a fun and excitable boy who embodies a Staffie’s best traits – a gentle nature and a big heart. This handsome boy loves human company and will flourish in a home where he can become a valued member of the family. However, due to his boisterous nature, Kyle would be best suited to a grown up family who are committed to keeping this ball of energy physically and mentally active. Kyle needs positive, ongoing obedience training to teach him some good doggy manners and how to best interact with other dogs. With gradual socialisation and a patient, committed owner, this cuddly character will thrive in his new home. Harry is nearly eight years-old, but he certainly doesn’t act like it. This affectionate and happy character is still full of beans! 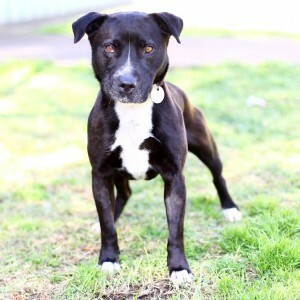 An affectionate and enthusiastic dog, Harry enjoys being physically and mentally active. If you are an energetic person, then Harry might be a good match for you. Harry already has an understanding of basic commands; however these can be quickly forgotten when this happy character gets too excited. With ongoing training and a loving family environment Harry will blossom into a committed and loyal family member. Don’t let their age deter you, 10 year-old Klohe and eight year-old Petra are two balls of energy, looking for an active family to call their own. With boundless energy, these close friends enjoy nothing more than staying physically and mentally active. While Petra and Klohe know some basic manners, these smart cookies need to stay mentally active and spending time at a doggy obedience class might just be the mental stimulation they need. These bubbly Staffies are most comfortable when they are together and are looking for a special owner who is looking to open their home and heart to not one, but two, special dogs. In return these two beautiful dogs will thrive and blossom in their new home. Kyle, Harry, Klohe and Petra are just three of the Staffies we currently have available for adoption. You can view the other dogs looking for a home here. You can meet Kyle, Klohe and Petra in the fur at our North Melbourne shelter at 2 Gracie Street North Melbourne. Happy Harry is based at our Campaspe shelter at 520 McKenzie Road, Echuca.